The continuing struggle against the Islamic State (IS, formerly ISIS/ISIL) must be led by the Iraqi Security Force (ISF) with the backing of a strong international coalition, the UK’s ambassador to Iraq has said. In an interview, originally published in the Bahraini newspaper Al-Wasat, Ambassador Frank Baker said the “barbaric” group had come under “serious pressure” from Iraqi forces, who had reclaimed nearly 700 square kilometers of IS-held territory. Baker added that the international response to the crisis should be led by the ISF with support from a “unified” coalition. He revealed the UK had donated 300 tons of weaponry and ammunition to ISF forces in the Kurdistan region on behalf of coalition forces, including 40 heavy machine guns and nearly half a million rounds of ammunition, as well as providing training against improvised explosive devices (IEDs). 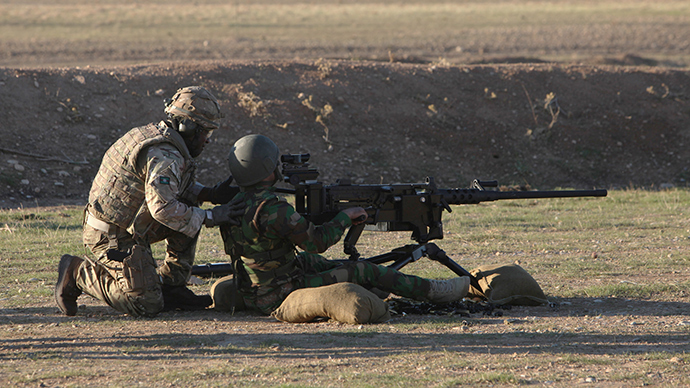 “Our Armed Forces are helping train the Iraqi Security Forces on the ground in Iraq. It is in our interests – and Iraq’s – that we offer the unique expertise the UK possesses, particularly where we have assets that no other coalition ally can contribute. “We have already delivered counter IED training to the ISF in the Kurdistan region of Iraq, and have funded a course in Baghdad,” he said. The additional support for ISF troops comes after a government report deemed the UK’s military presence in IS-controlled areas inadequate. The Defence Committee’s report claimed the UK has the military capability, expertise and resources to make a greater contribution in the fight against the Islamic State, including support for Iraqi forces, and can also play a role in encouraging a political solution. In order to prevent the further spread of the militant group, the UK announced in February it will send 2,000 specialist troops and a spy plane to Jordan. An initial group of 60 military planners will join a coalition HQ in Jordan, which will be used to co-ordinate support for Kurdish and Iraqi troops, followed by a further 2,000 who will mainly act in a training capacity, a source told the Express.